I’ve long been a proponent of art as therapy, but I had not yet experienced such a drastic shift in symptoms as I did Wednesday evening. I had been struggling with flashbacks since last Thursday’s doctor’s appointment. It was made worse by the incident that came up Sunday evening. The image and feelings just kept repeating and intensifying unless I was bombarding myself with sensory input. I told Dr. C as much when I went in for that extra session Wednesday evening. When she asked if I wanted to talk about it, all I could do was nod. She then suggested doing some art around it. I nodded harder to that. I figured it was easier than speaking at the moment. We moved to the floor and got to work. She had me represent the “memory” as best I could (right side), and had me add the emotions to it also (left side). She then asked me what I wanted to change about the image to help make it feel safer. Did I want to add something between the image of the memory and the emotion? Was there something protective I could incorporate into it to help it feel better? I admit I was quite stumped. She started listing off suggestions, then dug through her bag of supplies for more ideas. She pulled out some felt, and offered that up. originally we were thinking of using it as a blanket or towel around the kid, but the color I happened to pick out (red, unusual for me b/c there was also blue there & I normally gravitate to blue) was already cut into a heart shape. As she realized it was a heart, she mentioned that it would be perfect. We re-adjusted the concept of a blanket/towel to using the heart instead. She cut it down to fit on the page, then we set about trying to figure out how to attach it – glue doesn’t work too well on felt. Dr. C happened to have a needle and thread, so she suggested sewing it on. 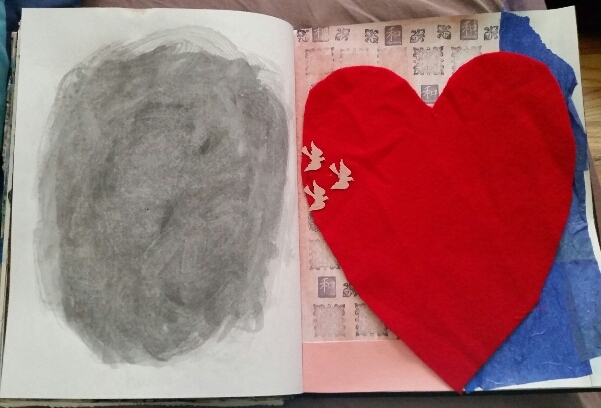 Yesterday, when describing the piece in group, I said that the heart was covering up the unpleasant image. Dr. C commented that it was an interesting choice of words, since it was meant as a protective measure more than a way to hide it from view… We didn’t delve further into it, but I’m sure there will be a conversation around it during Monday’s session. Either way (hiding from awareness or protecting from it), doing that project helped lessen the flashbacks. They are relatively minor intrusions in my day now, and it’s not nearly as disturbing as it had been all week. I’ve known expression through art can help change the impact of the trauma for a while. I have even used the technique of changing an expressive piece to help change the experience of whatever it was expressing, but it’s never been such an immediate and noticeable change. It’s always just crept up on me. I would realize the change a few hours or days later. This time, doing it in session with Dr C, it was a huge difference just in the hour and a half we spent on the piece. I went in to her office feeling raw, triggered, and spent, but left feeling lighter and able to smile. It felt a lot like the change in symptoms after an EMDR session. I think part of the relief came from sharing not only the incident, but also the experience of changing it. As I mentioned before, I have tried changing the art to change the thoughts around what it expresses, but it felt more “healing” to be doing it with the help of a safe person. If you are having a rough time with things, this might be a good technique to try. It’s helpful to have a therapist around to make the overwhelming parts feel a bit less overwhelming, but it can be accomplished solo also. I will try to look up the link to the study I remember reading about this technique. I think I saved the link (or article) somewhere. I just have to find it again. I’ll add it here when I do. UPDATE: found that article & how to link to it. It’s a free-access article through Taylor & Francis. “Check, Change What You Need To Change and/or Keep What You Want”: An Art Therapy Neurobiological-Based Trauma Protocol. They actually have a bunch of free-access articles that you can read without having to purchase anything. It’s a great resource. We talked in therapy today about how the distraction and delay is morphing the urge to self-harm into a drive to accomplish the hurt in some way. It feels like there’s no balance without the hurt. If I don’t do it to myself, I need someone else to do it for me. Dr C asked if there was an urgency to the feeling, something along the lines of “let’s hurry up and get this over with”… then it hit me: it’s anxiety over what is “supposed” to happen next based on all the signals and triggers. Dr C suggested that it was a “little kid” way of gaining control over the uncertainty of when the unpleasant event would occur (she used the word “abuse” but I hesitate to call it that… not that it wouldn’t fit the label, but I can’t call it that at this time). Hurting myself would give me control over when the hurt happened. It would also set in motion the unpleasant consequences I know would follow (and of which I dread the arrival). It would end the anxiety… I guess looking at it like that, it makes sense. I’ve struggled for years with trying to understand the drive for being hurt after being triggered. She summed it up in a few sentences. We talked a bit about the distance from the newer memories that has grown cavernous since the move. I was telling Dr C that every time I got to a place of accepting that those memories were fake, they would pop up in a flash then hide away again. She suggested that it sounded as if I had processed them and filed them away again. I’m not sure they feel “processed” so much as they feel disconnected. I don’t remember them at all, even when I read what I wrote about them (those just seem like stories). There’s no emotion around it unless it comes up in flashback form. I’m totally seperated from it. Dr C still calls it “processed”, though we did throw around the idea that I’ve simply dissociated it again. I didn’t get to voice my desire to pick up the therapy pace, but she offered an additional session this week without my asking. I don’t really have the gas money, but I took her up on it. I really need to launch myself past all this. The more depressed I get, the more I fear falling apart again. I don’t want that to keep being my future. It’s scary and hopeless. I want something better. …but maybe this could help? After all, every demon has it’s reasons. I’m a big proponent of looking at the stresses faced by anyone prior to their committing a crime (well, any behavior really). I want to look at their lives and their environments to see if I can figure out what went wrong (so much of the time, it’s more than the average person would know how to handle. It makes sense that they might choose the path they did). Providing further psychological torture really just makes things worse, not better. I’m glad someone is taking the initiative to try this out. I hope they keep it up. The wife and I spent the afternoon with the kids. We carved large pumpkins, painted smaller ones, watched Hocus Pocus, and had a grand time enjoying the activities and each other’s company. As much as I wanted to bawl my eyes out before we got there, getting lost in the moment with the family helped me move out of that frame of mind. Also important: the part about remembering to eat. I lose my appetite when really depressed (comes after the stage of eating every comfort food I can get my hands on).